For the last few years Becky has done lots of baking for her running club and always tries to make the baking in the running club colours – red and yellow. So when Tom joined a hockey club up here I decided I would start doing some team-colour themed baking for him. His hockey team, JPC HC, plays in blue and yellow and the first thing that came into my mind was minions – I’ve clearly made too many minion cakes! 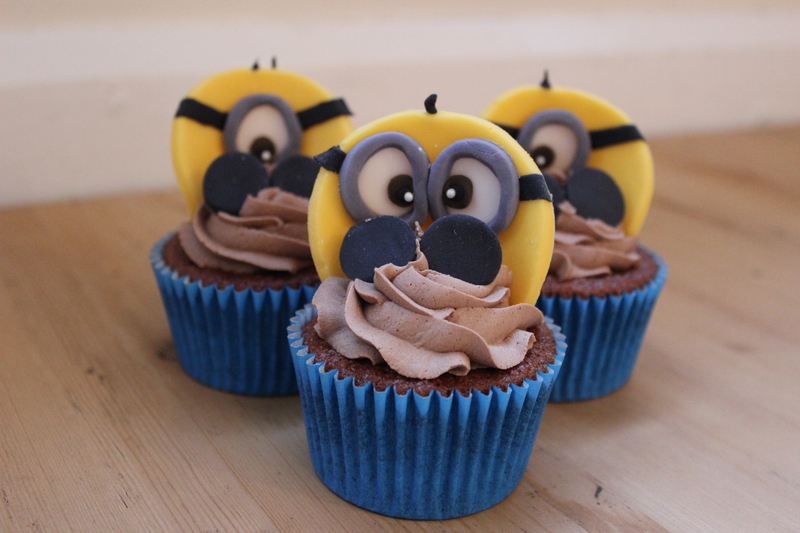 I’ve seen lots of minion cupcakes on Pinterest but none of them jumped out at me. Most of the cupcakes were covered in yellow fondant with minion faces on them. I wanted to do something slightly different so I tried to come up with some ideas. I looked through cupcakes I’d make in the past and saw the cheeky monkey ones – perfect! I used a 6cm cutter to cut out 12 circles from yellow fondant and then cut about 1cm off the bottom of each. I used a small (probably 1.5-2cm) cutter to cut 24 circles out of black fondant for the hands, and 18 circles out of white for the eyes. I used the fat end of 2 different sized piping nozzles to cut rings out of grey fondant for the goggles. I used the thin end of a Wilton no. 5 piping nozzle to cut 18 small circles out of brown fondant icing for the middle of the eyes. To assemble them, I stuck one white eyes on to six of the yellow circle and two onto the other six., (just using a paintbrush and a bit of water). I then stuck the goggles on top of each eye and a brown circle into the centre of each. I rolled out some black fondant really thinly and cut of narrow stripes, which I then stuck on from the edge of the goggles to edge of the head as the goggle straps. I rolled and squashed some very small balls of black fondant icing and stuck them to the centre of each of the brown eyes. I used some tiny white pearl balls for the centre of the eyes (for speed!) but you could use white fondant icing or pipe royal icing dots on. I rolled some small spikes of black icing between my finger and thumb for the hair – I put either one or three spikes on each. Finally I curled them a bit and left them stood on the work surface (leaning against the wall for support) to dry overnight.